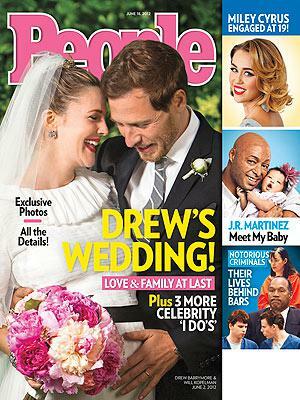 While we were all Jubilee-ing it up last weekend, Drew Barrymore was exchanging vows with her now husband Wil Kopelman. People Magazine got exclusive photos of the ceremony so we finally have a glimpse of Drew's gorgeous Chanel gown, custom-designed by Karl Lagerfeld. From the snippets I have seen, the muslin and organza dress is very traditional with tulle flowers embroidered on the skirt and a black belt to accentuate her baby bump. Drew told People "Everyone we love and care about was there. It was as fun and meaningful as we ever could have hoped." N'awwThe issue hits newstands on Friday so we can all get a closer look at her gorgeous dress. Do you like the look of Drew's Chanel dress?